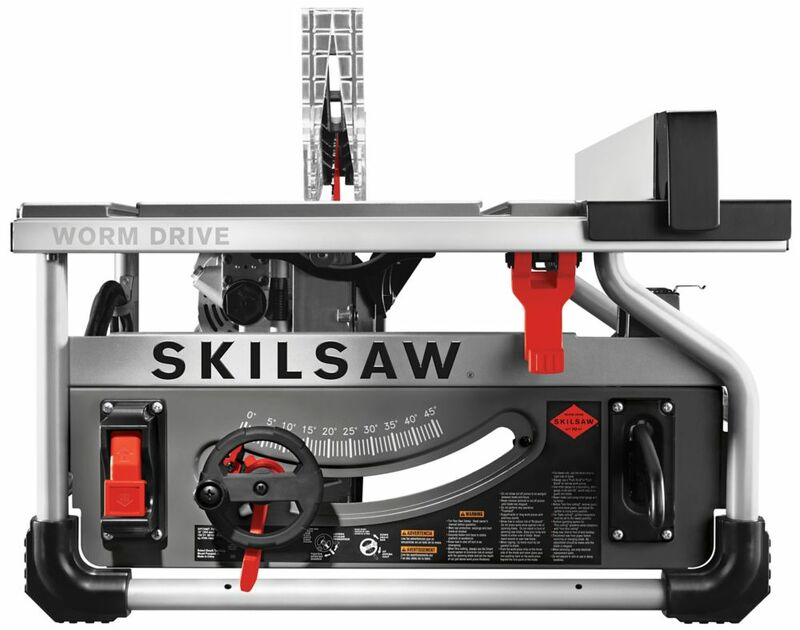 We're bringing something to the table that pros have wanted for a while the world's first Worm Drive table saw specifically designed for ripping. With the power and torque to tackle difficult cuts, bogging down is a thing of the past. The impressive 3-1/2 inch depth of cut and 25 inch rip capacity are big enough to rip plywood sheets in half. It also features our best-in-class Dual-Field Motor and smooth startup for a saw that runs cooler and lasts longer. Without sacrificing legendary SKILSAW durability, you get a compact and portable saw that will be the talk of the jobsite. Welcome to the next chapter in the Worm Drive legacy. Portable and compact weighing only 49 lbs. The Bosch GTS1041A-09 REAXX 10 inch jobsite table saw kit builds on Bosch's heritage of award-winning table saw design while providing the injury-mitigation Active Response Technology platform, which delivers a rapid drop of the saw blade below the tabletop when it detects human flesh coming in contact with the blade. It does so without damaging the blade, and after activation, the system can be reset in less than 60 seconds. The saw's onboard control panel is an easy-to-understand LED light display that integrates Near Field Communication (NFC) technology. This allows NFC-enabled phones to communicate information from the onboard control system - such as system activations, servicing needs and instructions. The saw works with nearly all standard 10 In. fine finish and construction-grade blades and stacked dado blades, it has a 25 In. rip fence capacity, and it has onboard storage for all necessary parts, instructions and wrenches. 15 amp Corded Electric 10-inch Portable Worm Drive Table Saw Kit with 30-Tooth Diablo Carbide Blade We're bringing something to the table that pros have wanted for a while the world's first Worm Drive table saw specifically designed for ripping. With the power and torque to tackle difficult cuts, bogging down is a thing of the past. The impressive 3-1/2 inch depth of cut and 25 inch rip capacity are big enough to rip plywood sheets in half. It also features our best-in-class Dual-Field Motor and smooth startup for a saw that runs cooler and lasts longer. Without sacrificing legendary SKILSAW durability, you get a compact and portable saw that will be the talk of the jobsite. Welcome to the next chapter in the Worm Drive legacy. 15 amp Corded Electric 10-inch Portable Worm Drive Table Saw Kit with 30-Tooth Diablo Carbide Blade is rated 4.3 out of 5 by 103. Rated 4 out of 5 by Greg from Great Saw I've had this saw for a couple of months and used it for a variety of small shop projects. It seems sturdy and well-made. I'm not a seasoned woodworker by any means, but I like how it works so far. I appreciate the little nooks inside the saw carcass which hold all of the accessories. It took me a little while to figure out how to attach the blade guard, but I eventually found a you tube video. It would be helpful if something like that could be made for this saw's page on the Skil site. So far I really like the saw, but I have two complaints. The first complaint is the fence. Well, the fence itself is good and there is nothing wrong with it per se. However, the much more expensive SPT99-11 has a rack and pinion fence whereas that isn't an option on this saw. But, I guess you get what you pay for so I can't complain too much about that. The second, and more serious complaint, is dust collection. I have a small Ridgid shop vac with a 1 7/8" hose and I can not figure out how to attach this to my saw. I bought a hose diameter adapter kit from Ridgid, but that didn't solve my problem. Any thoughts? Rated 3 out of 5 by Benjamin from Fence issue This is a powerful saw and one of the best portable ones that accept dado. However, I don’t like the fence mechanism, i wish I could have adjust the fence like the new model. The fence doesnt align perfectly. Rated 5 out of 5 by Gerb from Great table saw I have not used it much. I’m very pleased with it so far. Rated 5 out of 5 by HomeDepotCustomer from Extremely impressed with the power of this saw. Seems built... Extremely impressed with the power of this saw. Seems built well and I like the portability it provides. Fence stores securely but cross cut guide falls off easily. Rated 5 out of 5 by Daniel from Great quality. Very easy to use. ... Great quality. Very easy to use. Rated 5 out of 5 by Luke from Best in class! I have been a professional carpenter for 12yrs now, in construction for 22yrs. This is by far the best portable table saw I have ever used. has all the power you need to rip through any board. seriously worth the money. Rated 5 out of 5 by SGTMAJ from Nice Saw for Home Owner I am a home owner and wanted to replace my inexpensive bench saw. I have found this saw to be well made and powerful. The miter and fence should be upgraded, but for the portability, and storage of all the accessories on board this saw is easy to take to the work, and keep everything together. I really like it's accuracy over my old saw, and you can do smaller projects and get accurate cuts rather than just be able to rip sheet goods with it. Are the Sidewalls made of Plastic or Metal?